That guy who played the goofy one from Friends, also known as Matt LeBlanc, was today named as one of the new presenters of Top Gear alongside British radio DJ Chris Evans. Along with the Stig, that makes for three hosts. But according to our count, the final total amount of on-screen talent will be at least five. 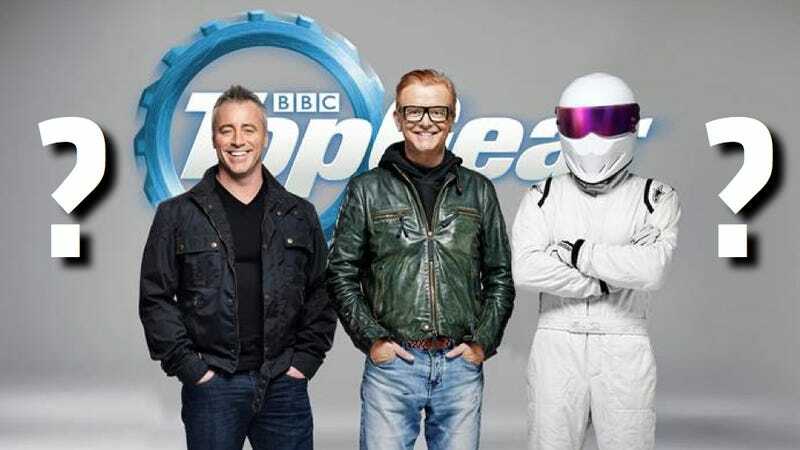 He joins production immediately and additional Top Gear cast members will be confirmed shortly. The word “members,” particularly astute fans of the English language will note, is a plural word. Meaning that there is more than one on-screen presenter that is yet to be announced. Bradley: Now you’re going to be very busy, uh, filming…I’m from the UK, so I’m going to see you on my TV screen in the new Top Gear program. How’s things going with that? Schmitz: Oh sorry, no comment. Bradley: Oh really! You’re not allowed to tell us? Schmitz: You know, I’m all the time with Top Gear, but not as an, um, host. Which is a weird way to put things! If you weren’t going to be an on-screen member of Top Gear, it’d be easy to say “oh no, I’m not going to be a regular Top Gear person, but as fans of the show know, I do things with them all the time.” Instead, we got a “no comment,” followed by a “you know, I’m all the time with Top Gear, but not as an, um, host,” which just sounds like a very “it’s complicated” Facebook relationship status. And sure, we can chalk it up to English not being Schmitz’s first language, if we’re being incredibly generous, but she seems to have no problem with it at all in her many television appearances. So, with LeBlanc in, it doesn’t mean that Harris, Schmitz, or even Mickey Mouse is necessarily out. Nor does it mean that anyone specific is in, either. But if we’ve already got three, and there’s more than one left to go, that makes a grand total of at least five Top Gear presenters. I don’t know. Math was never really my strong suit. Or reading and writing words good.